If there was a way to let your body do more of the work of getting and staying on target, wouldn’t you want to take advantage of that? Of course, you would! It’s not so much about doing more of the work as it is about getting, and more importantly, staying on target. The bottom line is this. If you can allow your body to “naturally” assume more responsibility, then you can shoot more accurately and more consistently. Having to force your body, arms, and hands to make accurate hits leads to fatigue and therefore inconsistency. That’s where natural point of aim comes into play. When shooting rifles, handguns, or shotguns, using "natural point of aim" simply means assuming the stance and position where your body naturally wants to point the gun. Perhaps the easiest way to illustrate natural point of aim is to look at unnatural point of aim. Unnatural point of aim refers to any position where you have to “force” or “muscle” the sights of the gun onto the target. The most extreme example of unnatural point of aim would be standing with your back facing the intended target. Think about all the effort it would take to get your sights on target. Less dramatic examples include assuming any shooting position that requires you to move your arms, shoulders, waist, or hands to “force” the gun into alignment with the target. If you have to expend any effort at all to “force” your gun to the target, you are creating fatigue in your muscles, eyes, and brain. The second you relax one or more of those, your sights will come off target. It’s one of those “oh, duh” things when you think about it. 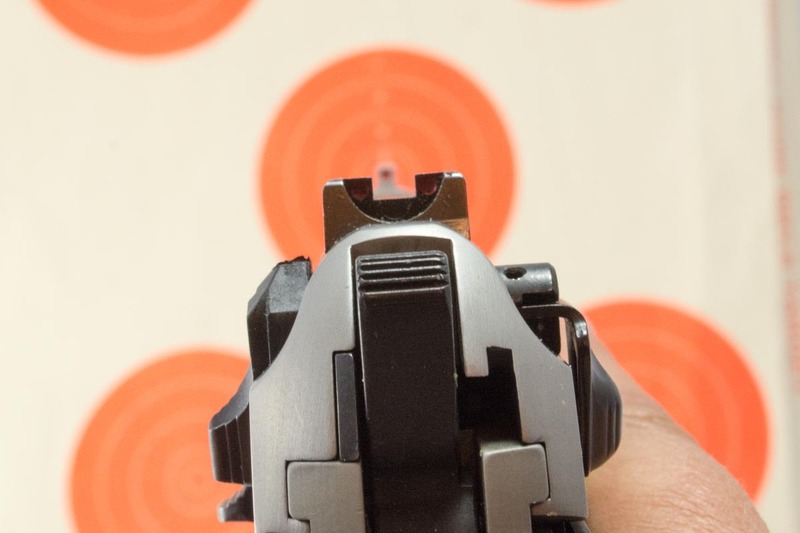 Shooting from a naturally relaxed and comfortable position where the gun is already pointed at the target will help you shoot more accurately, more consistently, and with better shot-to-shot performance. You’ll also get the sights on target quicker if your body is already somewhat aligned. The best place to work on finding your natural point of aim is at the shooting range, mainly because it allows you to see your results as you practice. It’s also safer because you’re already in a place where you can point your gun safely at a target and backstop. First, ensure your firearm is on safe and unloaded. Next, assume your normal shooting stance with your gun pointed at the intended target. Make sure your sights are lined up at a very specific point on the target. Close your eyes and take a couple of deep breaths. Think about all those who have passed before us. Do NOT try to force your gun to stay on target — that's cheating. Remember what Miss Ninnymuggins used to say back in fifth grade: you’re only hurting yourself! Now open your eyes. What do you see? Are your sights still lined up on the target? If your sights are now lined up to one side or the other of your desired aiming point, that’s an easy fix. Just have the range officer move the target a bit to the side! But seriously, you can do a scaled-down version of the Ickey Shuffle to get your sights back on target. If you don’t know what the Ickey Shuffle is, just Google “Best Football End Zone Dances Ever” and you’ll get it. Simply put, shuffle your feet to realign your whole body, so your sights line up on target. If you find your sights pointed a bit high after opening your eyes, try moving your shooting hand side foot forward just a tad. That can help lower your sights a bit. The opposite works if your aim point is low–move that same foot back just a touch. Now, just to make sure you’ve really found your natural point of aim, briefly close your eyes again. When you open them are you still on target? Repeat this exercise until your body position is just right. Do this exercise repeatedly to make sure your stance is naturally consistent and aligned with your target. Soon, you won’t have to close your eyes and dance anymore. You’ll find that when you assume a shooting position, your body will find its natural point of aim. Obviously, this isn’t something you will do in a tactical or self-defense shooting situation. “Hang on a sec! I need to find my natural point of aim!” The whole idea is to do this at the practice range to build a habit. After a few repetitions, you’ll find that you naturally assume a stance that’s correct relative to the target. When shooting for fun or competition, you’ll be amazed at your ability to shoot more consistently over time.